I have a buddy—his name is Leon Saunders—and he lives in Atlanta, and I started calling him "the professor", and he started calling me "the doctor". So it was just between us...we were buddies, we had our nicknames and we would roll with the nicknames. Lo and behold we graduate from high school together, we both go to U-Mass, and we separated for many years 'cause he went over to Africa and did some stuff, and I went my way. But now he's my golf buddy in Atlanta...and I love him. He's just like a little brother to me even though, you know, there's only months between us. But he's the professor and he was the first one to call me "the doctor". And that's where it came from. Erving recalled, "[L]ater on, in the Rucker Park league in Harlem, when people started calling me 'Black Moses' and 'Houdini', I told them if they wanted to call me anything, call me 'Doctor,'" Over time, the nickname evolved into "Dr. Julius," and finally "Dr. J." Erving enrolled at the University of Massachusetts in 1968. In two varsity college basketball seasons, he averaged 26.3 points and 20.2 rebounds per game, becoming one of only six players to average more than 20 points and 20 rebounds per game in NCAA Men's Basketball. At that time, professional basketball was in flux, split between two leagues whose players rapidly switched clubs and leagues. Erving joined the ABA in 1971 as an undrafted free agent with the Squires. Erving quickly established himself as a force and gained a reputation for hard and ruthless dunking. He scored 27.3 points per game as a rookie, was selected to the All-ABA Second Team, made the ABA All-Rookie Team, led the ABA in offensive rebounds, and finished second to Artis Gilmore for the ABA Rookie of the Year Award. He led the Squires into the Eastern Division Finals, where they lost to the Rick Barry-led New York Nets in seven games. The Nets would eventually go to the finals, losing to the star-studded Indiana Pacers team. When he became eligible for the NBA draft in 1972, the Milwaukee Bucks picked him in the first round (12th overall). This move would have brought him together with Oscar Robertson and Kareem Abdul-Jabbar. Instead, the 6 feet 7 inches (2.01 m), 210-pound (95 kg) Erving signed a contract with the Atlanta Hawks before the 1972 draft when he discovered his former agent Steve Arnold happened to work for the Squires, deluding him to sign for a low paying contract. As attorneys tried to reach an agreement among three teams in two leagues, Erving joined Pete Maravich and the Hawks's training camp, as they prepared for the upcoming season. Erving enjoyed his brief time with Atlanta, and he would later duplicate with George Gervin his after-practice playing with Maravich. He played three exhibition games with the Hawks until, because of a legal injunction, he was obliged by a three-judge panel to return to the ABA Squires. The NBA fined Atlanta $25,000 per game for Erving's Hawks appearances because Milwaukee owned his NBA rights. Back in the ABA, his game flourished, and he achieved a career-best 31.9 points per game in the 1972–1973 season. The following year, the cash-strapped Squires sold his contract to the New York Nets. The Squires, like most ABA teams, were on rather shaky financial ground. They were forced to trade Erving to the Nets in 1973—a move which eventually sent the Squires into oblivion. Erving led the Nets to their first ABA title in 1973–74, defeating the Utah Stars. Erving established himself as the most important player in the ABA. His spectacular play established the Nets as one of the better teams in the ABA, and brought fans and credibility to the league. The end of the 1975–76 ABA season finally brought the ABA–NBA merger. The Nets and Nuggets had applied for admission to the NBA before the season, in anticipation of the eventual merger that had first been proposed by the two leagues in 1970 but which was delayed for various reasons, including the Oscar Robertson suit. The Erving-led Nets defeated the Denver Nuggets in the swan-song finals of the ABA. In the postseason, Erving averaged 34.7 points and was named Most Valuable Player of the playoffs. That season, he finished in the top 10 in the ABA in points per game, rebounds per game, assists per game, steals per game, blocks per game, free throw percentage, free throws made, free throws attempted, three-point field goal percentage and three-point field goals made. In all, Erving played five seasons in the ABA. In that time, he won two championships, three MVP trophies, and three scoring titles. He was also a four-time All-ABA First Team selection. The Nets, Nuggets, Indiana Pacers, and San Antonio Spurs joined the NBA for the 1976–77 season. With Erving and Nate Archibald (acquired in a trade with Kansas City), the Nets were poised to pick up right where they left off. However, the New York Knicks upset the Nets' plans when they demanded that the Nets pay them $4.8 million for "invading" the Knicks' NBA territory. Coming on the heels of the fees the Nets had to pay for joining the NBA, owner Roy Boe reneged on a promise to raise Erving's salary. Erving refused to play under these conditions and held out in training camp. After several teams such as the Milwaukee Bucks, Los Angeles Lakers and Philadelphia 76ers lobbied to obtain him, the Nets offered Erving's contract to the New York Knicks in return for waiving the indemnity, but the Knicks turned it down. This was considered one of the worst decisions in franchise history, which caused the Walt Frazier led-dynasty in the 70s to collapse quickly. The Knicks would become one of the worst teams in the league until they had the 1st pick in the 1985 NBA draft, which they used to select Patrick Ewing from Georgetown. The Sixers then decided to offer to buy Erving's contract for $3 million—roughly the same amount as the Nets' expansion fee—Boe had little choice but to accept. This would total $6 million overall, with the other half going to Erving. His new jersey number 6 would derive from the $6 million paid by the Philadelphia 76ers; it also matched the team nickname "Sixers". For all intents and purposes, the Nets traded their franchise player for a berth in the NBA. The Erving deal left the Nets in ruin; they promptly crashed to a 22–60 record, the worst in the league. Years later, Boe regretted having to trade Erving, saying, "The merger agreement killed the Nets as an NBA franchise . . . . The merger agreement got us into the NBA, but it forced me to destroy the team by selling Erving to pay the bill." Erving quickly became the leader of his new club and led them to an exciting 50-win season. However, playing with bigger stars forced his role to diminish. In the ABA, he would be told to do everything for his team. With the Sixers, he focused more on scoring. Despite a smaller role, Erving stayed unselfish. The Sixers, featuring other stars like ABA co-MVP George McGinnis, ABA All-Star Caldwell Jones, future All-Star World B Free (then Lloyd Free), outside shooting threat Henry Bibby (father of Mike Bibby), and the versatile and aggressive Doug Collins (later Michael Jordan's coach during the late 80s), won the Atlantic Division and were the top drawing team in the NBA. The Sixers defeated the defending champions, the Boston Celtics, to win the Eastern Conference. Erving took them into the NBA Finals against the Portland Trail Blazers of Bill Walton. After the Sixers took a 2–0 lead, however, the Blazers defeated them with four straight victories after the famous brawl between Maurice Lucas and Darryl Dawkins which ignited the Blazers' chemistry. However, Dr. J enjoyed success off the court, becoming one of the first basketball players to endorse many products and to have a shoe marketed under his name. It was at this time that he appeared in television commercials urging young fans asking for his autograph in an airport to refer to him henceforth as "Dr. Chapstick". He also starred in the 1979 basketball comedy film, The Fish That Saved Pittsburgh. A famous TV commercial for Sixers season tickets during the 1977–78 off-season summed up Erving's desire to win an NBA Title. In the commercial, Erving was in the Sixers locker room and he said to fans, "We owe you one" while he held up his index finger. It took a few years for the Sixers franchise to build around Erving. Eventually coach Billy Cunningham and top-level players like Maurice Cheeks, Andrew Toney, and Bobby Jones were added to the mix and the franchise was very successful. In the following years, Erving coped with a team that was not yet playing at his level. The Sixers were eliminated twice in the Eastern Conference Finals. In 1979, Larry Bird entered the league, reviving the Boston Celtics and the storied Celtics–76ers rivalry; these two teams faced each other in the Eastern Conference Finals in 1980, '81, '82, and '85. The Bird vs. Dr. J matchup became arguably the top personal rivalry in the sport (along with Bird vs. Magic Johnson), inspiring the early Electronic Arts video game One on One: Dr. J vs. Larry Bird. In 1980, the 76ers prevailed over the Celtics to advance to the NBA Finals against the Los Angeles Lakers. There, Erving executed the legendary "Baseline Move", a behind-the-board reverse layup. However, the Lakers won 4–2 with superb play from, among others, Magic Johnson. 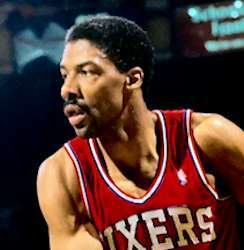 Erving again was among the league's best players in the 1980–1981 and 1981–1982 seasons, although more disappointment came as the Sixers stumbled twice in the playoffs: in 1981, the Celtics eliminated them in 7 games in the 1981 Eastern Finals after Philadelphia had a 3–1 series lead, but lost both Game 5 and Game 6 by 2 points and the deciding Game 7 by 1) and in 1982, the Sixers managed to beat the defending champion Celtics in 7 games in the 1982 Eastern Finals but lost the NBA Finals to the Los Angeles Lakers in 6 games. Despite these defeats, Erving was named the NBA MVP in 1981 and was again voted to the 1982 All-NBA First Team. Finally, for the 1982–83 season, the Sixers obtained the missing element to combat their weakness at their center position, Moses Malone. Armed with one of the most formidable and unstoppable center-forward combinations of all time, the Sixers dominated the whole season, prompting Malone to make the famous playoff prediction of "fo-fo-fo (four-four-four)" in anticipation of the 76ers sweeping the three rounds of the playoffs en route to an NBA title. In fact, the Sixers went four-five-four, losing one game to the Milwaukee Bucks in the conference finals, then sweeping the Lakers to win the NBA title. Erving maintained his all-star caliber of play into his twilight years, averaging 22.4, 20.0, 18.1, and 16.8 points per game in his final seasons. In 1986, he announced that he would retire after the season, causing every game he played to be sold out with adoring fans. That final season saw opposing teams pay tribute to Erving in the last game Erving would play in their arenas, including in cities such as Boston and Los Angeles, his perennial rivals in the playoffs. Erving retired in 1987 at the age of 37. "A young Julius Erving was like Thomas Edison, he was always inventing something new every night", Johnny Kerr told ABA historian Terry Pluto. He is also one of the few players in modern basketball to have his number retired by two franchises: the Brooklyn Nets (formerly the New York Nets and New Jersey Nets) have retired his No. 32 jersey, and the Philadelphia 76ers his No. 6 jersey. He was an excellent all around player who was also an underrated defender. In his ABA days, he would guard the best forward, whether small forward or power forward, for over 40 minutes a game, and simultaneously be the best passer, ball handler, and clutch scorer every night. Many of Erving's acrobatic highlight feats and clutch moments were unknown because of the ABA's scant television coverage. He is considered by many as the greatest dunker of all time. In his ABA and NBA careers combined, he scored more than 30,000 points. In 1993, Erving was elected to the Naismith Memorial Basketball Hall of Fame. When he retired, Erving ranked in the top 5 in scoring (third), field goals made (third), field goals attempted (fifth) and steals (first). On the combined NBA/ABA scoring list, Erving ranked third with 30,026 points. As of 2013, Erving ranks sixth on the list, behind only Kareem Abdul-Jabbar, Karl Malone, Michael Jordan, Kobe Bryant and Wilt Chamberlain. Erving in this memorable contest would face George "The Ice Man" Gervin, All-Star and former teammate Larry Kenon, MVP Artis "The A-Train" Gilmore, and David "The Skywalker" Thompson. Erving would start by dunking two balls in the hoop. Then, he would release a move that brought the slam dunk contest to the national consciousness. He would go all the way to the end of the court and run to release a free throw line dunk. Although dunking from the foul line had been done by other players (Jim Pollard and Wilt Chamberlain in the 1950s, for example), Erving introduced the dunk jumping off the foul line to a wide audience, when he demonstrated the feat in the 1976 ABA All-Star Game Dunking Contest. This transpired during game 6 of the 1977 NBA Finals. After Portland made a basket, Erving immediately ran full court with the whole Blazers team defending him. He made a cross-over in front of multiple defenders and just glided to the hoop with ease. With the defensive UCLA legend Bill Walton waiting in the post, Erving threw a vicious slam dunk. This dunk is considered by many to be one of the strongest dunks ever attempted considering he ran full court with all five defenders running with him. This move was one of the highlights of his arrival to a more television-exposed NBA. One of his most memorable plays occurred during the 1980 NBA Finals, when he executed a seemingly impossible finger-roll behind the backboard. He drove past Lakers forward Mark Landsberger on the right baseline and went in for a layup. Then 7′2″ center Kareem Abdul-Jabbar crossed his way, blocking the route to the basket and forcing him outwards. In mid-air, it was apparent that Erving would land behind the backboard. But somehow he managed to reach over and score on a right-handed layup despite the fact that his whole body, including his left shoulder, was already behind the hoop. This move, along with his free-throw line dunk, has become one of the signature events of his career. It was called by Sports Illustrated, "The, No Way, even for Dr J, Flying Reverse Lay-up". Dr J called it "just another move". Another of Erving's most memorable plays came in the final moments of a regular-season game against the Los Angeles Lakers in 1983. After Sixers point guard Maurice Cheeks deflected a pass by Lakers forward James Worthy, Erving picked up the ball and charged down the court's left side, with one defender to beat—the Lakers' top defensive player Michael Cooper. As he came inside of the 3-point line, he cupped the ball into his wrist and forearm, rocking the ball back and forth before taking off for what Lakers radio broadcaster Chick Hearn best described as a "Rock The Baby" slam dunk: he slung the ball around behind his head and dunked over a ducking Cooper. This dunk is generally regarded as one of the greatest dunks of all time. Erving earned his bachelor's degree in 1986 through the University Without Walls at the University of Massachusetts Amherst. After his basketball career ended, he became a businessman, obtaining ownership of a Coca-Cola bottling plant in Philadelphia and doing work as a television analyst. In 1997, he joined the front office of the Orlando Magic as Vice President of RDV Sports and Executive Vice President. Erving and former NFL running back Joe Washington fielded a NASCAR Busch Series team from 1998 to 2000, becoming the first ever NASCAR racing team at any level owned completely by minorities. The team had secure sponsorship from Dr Pepper for most of its existence. Erving, a racing fan himself, stated that his foray into NASCAR was an attempt to raise interest in NASCAR among African-Americans. He has also served on the Board of Directors of Converse (prior to their 2001 bankruptcy), Darden Restaurants, Inc., Saks Incorporated and The Sports Authority. As of 2009, Erving was the owner of The Celebrity Golf Club International outside of Atlanta, but the club was forced to file for bankruptcy soon after. He was ranked by ESPN as one of the greatest athletes of the 20th Century. Erving is a Christian. Erving has spoken about his faith saying, "After searching for the meaning of life for over ten years, I found the meaning in Jesus Christ." Erving was married to Turquoise Erving from 1972 until 2003. Together they had four children. Their son, Cory, drowned after driving his vehicle into a pond in 2000. In 1979, Erving began an adulterous affair with sportswriter Samantha Stevenson, resulting in the 1980 birth of American tennis player, Alexandra Stevenson. Although Erving's fatherhood of Alexandra Stevenson was known privately to the families involved, it did not become public knowledge until Stevenson reached the semifinals at Wimbledon in 1999, the first year she qualified to play in the tournament. Erving had provided financial support for Stevenson over the years, but beyond that, had not been a part of her life. The public disclosure of their relationship did not initially lead to contact between father and daughter. However, in 2008, Stevenson contacted him, and they at last did initiate a further relationship with one another. In 2009 Erving attended the Family Circle Cup tennis tournament to see Stevenson play, marking the first time he had attended one of her matches. In 2003, Erving fathered a second child outside of his marriage, Justin Kangas, this time with a woman named Dorýs Madden. Julius and Turquoise Erving were subsequently divorced. Julius Erving continued his relationship with Madden, with the couple having three more children together. In 2008, Erving and Madden were married. Julius Erving has in total fathered 9 children. ↑ J. Ted Carter. (September 1, 1971). "Patterned fast-break basketball". Retrieved July 20, 2015. ↑ Golliver, Ben. (June 11, 2013). "Video: Julius 'Dr. 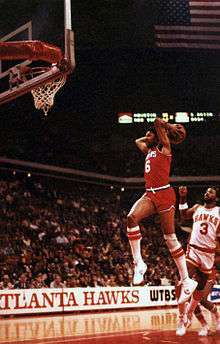 J' Erving can still dunk a basketball at age 63". Sports Illustrated. Retrieved July 20, 2015. ↑ Carson, Dan. (June 11, 2013). "This Video of Julius Erving Dunking at the Age of 63 Is Life-Changing". Bleacher Report. Retrieved July 20, 2015. ↑ Historical dictionary of the 1970s. Retrieved March 22, 2011. ↑ Jack Salzman (September 17, 2008). Encyclopedia of African-American Culture and History. Retrieved March 22, 2011. ↑ "Dr. J operated above the rest". ESPN. Retrieved March 22, 2011. ↑ "Julius Erving Summary". NBA.com. Retrieved March 22, 2011. ↑ "Dr. J' Julius Erving explains his nickname exclusively to Class Act Sports". Retrieved 2012-05-21. ↑ Vincent Mallozzi. Doc: The Rise and Rise of Julius Erving. 60-61. ↑ Bill Rhoden. "The Incredible Dr. J". Ebony. March 1975. 47. ↑ Julius Erving Biography, ESPN. Retrieved Nov. 17, 2013. ↑ Phil Jasner, Philadelphia Daily News, The Graduate On Sunday, Julius Erving Gets His College Degree, May 23, 1986. Retrieved Nov. 17, 2013. ↑ "1971-72 New York Nets Roster and Stats". basketball-reference.com. Retrieved July 20, 2015. 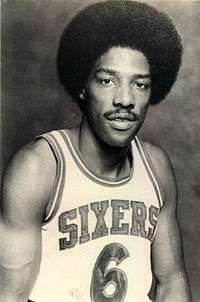 ↑ "NBA.com: Julius Erving Bio". NBA Media Ventures, LLC. Retrieved December 16, 2008. ↑ Frederick J. Day. (2004). "Clubhouse Lawyer: Law in the World of Sports". Retrieved July 20, 2015. ↑ NBA TV – Greatest NBA Rivalries. (Available on Video on YouTube), Accessed 16th September 2013. ↑ Watanabe, Ben. (August 7, 2012). "Julius Erving Wore No. 6 With Sixers to Be Like Bill Russell, ‘One of My Heroes’ (Video)". Retrieved July 20, 2015. ↑ "1976-77 NBA Season Summary". basketball-reference.com. Retrieved July 20, 2015. ↑ "Walton, Lucas Ignite 'Blazermania'". Retrieved July 20, 2015. ↑ "Doctor's Shot Stuns Lakers". NBA.com. Retrieved March 22, 2011. ↑ Persaud, C.H.K. (2004). Famous People Speak about Jesus: A Compendium of Expressions of Praise and Reverence. Xlibris Corporation. ISBN 1465325751. ↑ CBC Sports (August 2, 2000). "Son of Julius Erving died of accidental drowning". CBC Sports. Retrieved March 22, 2011. 1 2 Friend, Tom (December 15, 1980). "Reaching Out". ESPN. Retrieved March 22, 2011. ↑ "Stevenson loses in first round". Associated Press. April 14, 2009. Wikimedia Commons has media related to Julius Erving.